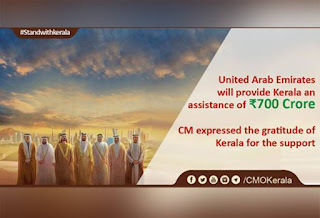 UAE's 700 crore to Kerala. What is the Truth? HomeSouth IndiaUAE's 700 crore to Kerala. What is the Truth? As Kerala was battered by its worst natural calamity in memory(read this article), help poured in from all over the world. UAE, which has a long history with Kerala due to the strong migration pattern between Kerala and the Gulf country, allegedly offered the biggest external aid of all, amounting to Rs.700 crore. The same was announced by Kerala CM Pinarayi Vijayan via his official twitter handle. A controversy was raked up when the central government and the Ministry of External Affairs said it was unlikely to help foreign aid for a domestic crisis, as per an unwritten rule in foreign diplomacy. Many parties chipped in their 2 cents about how to interpret this action, with various hashtags trending on social media, some slamming the centre, some the state. However, things took a murkier turn when the UAE's ambassador to India said that no such aid had been officially declared by the UAE government. Mudslinging has intensified on social and other media, with parties on all sides of the fence flinging blame on each other. With the UAE government themselves denying any such aid, CM Pinarayi Vijayan's tweet has clearly been proven to be a classic case of fake news. Coming from a reputed and trust-worthy source, the Kerala Chief Minister himself, many took it at face value without verifying the facts. These include various BJP central ministers, including Union Minister of State for Electronics and Information Technology, Culture, and Tourism, Alphons Kannanthanam, appreciated the "kind gesture" by the UAE. It must, however, be noted that Prime Minister Modi never did support or second CM Vijayan's tweet. The PM's tweet to UAE's PM His Highness Sheikh Mohammed bin Rashid Al Maktoum stating "big thanks" for "gracious offer to support" Kerala was made on August 18, 3 days before the Kerala CM made his claims on Twitter. Further, there is a world of difference between "gracious offer" and "gracious offer to support". Thus, anyone purporting that Modi's tweet implicates him too in CM Vijayan's claims is doing nothing but trying to spread falsified information using words taken out of context. A grave matter of concern, however, is that, at the drop of a hat, or in this case, a hint of a non-existent 100 million dollars aid, many in Kerala were more than happy to drag the Central Government, and India, through the mud and lavish praise on UAE. There were even calls for a session and the formation of a "United States of South India". This is worrying in more ways than one because it strikes at the very root of Indian nationalism and unity. The trolls, and their supporters, who unleashed venom on India, because it made an announcement in lieu with national policy, must now introspect on where their loyalties lie. Kerala has a long-standing healthy relation with the UAE, and CM Pinarayi Vijayan is unlikely to jeopardize that for flimsy, and easily disputable, claims. Thus, it can be safely and logically assumed that his tweets about Rs.700 crore relief by UAE are rooted in facts. In his tweet, the CM had specifically stated that UAE's decision to help Kerala was indeed communicated to PM Modi by Abu Dhabi crown prince Sheikh Mohammed bin Zayed bin Sultan Al-Nahyan. He further goes on to state that the information was first communicated to UAE based businessman and owner of India's largest mall, Lulu Mall, Yusuff Ali M.A. It is also to be noted that UAE government has not denied any aid offered to Kerala outright. Rather, the statement by the ambassador implied that "no specific amount" has been decided upon nor communicated officially. This does not de facto negate the Kerala CM's claims, but the rather puts a question mark over whether the CM overstepped his line by tweeting about foreign aid, primarily between UAE and India, before the Prime Minister or Ministry of External Affairs officially declared it. A plausible scenario is that Mr Yusuff Ali was the go-between in the foreign aid deal betwixt the governments in UAE, Kerala and India. The 700 crore might have been a ball in the park figure, but now that India government has shown its unwillingness to accept the amount of money - considering its own monetary aid for the relief amounted to only 600 crores - it is only natural for UAE's diplomacy to try to not risk embarrassment for the Modi government. The CM might have tweeted either before or after the government's decision to not allow foreign aid. In the former case, the CM might have been sharing a good news to cheer up his flood-ravaged state. In the latter, the CM might have been trying to whip up public opinion to force the central government to allow Kerala an exception considering its monumental losses. Either way, the CM had only the good of those affected by the deluge at heart, but unfortunately is now being made a scapegoat by the crafty central government to shift focus away from its shortcomings during the rescue and relief operations.